Main Beach, near Surfers Paradise, has come a long way since I briefly lived in the area in 1990. The high-rise apartments interspersed with a dwindling number of shacks that stubbornly refuse to sell the land from underneath them to developers, is the same. However, the bustling strip of restaurants and bars has definitely grown 10 fold and then some. Tedder & Woodroffe Lounge & Dining named for its location on the corner of the two cross streets bearing the same names is not the kind of place you expect to find a Devonshire Tea on the menu. 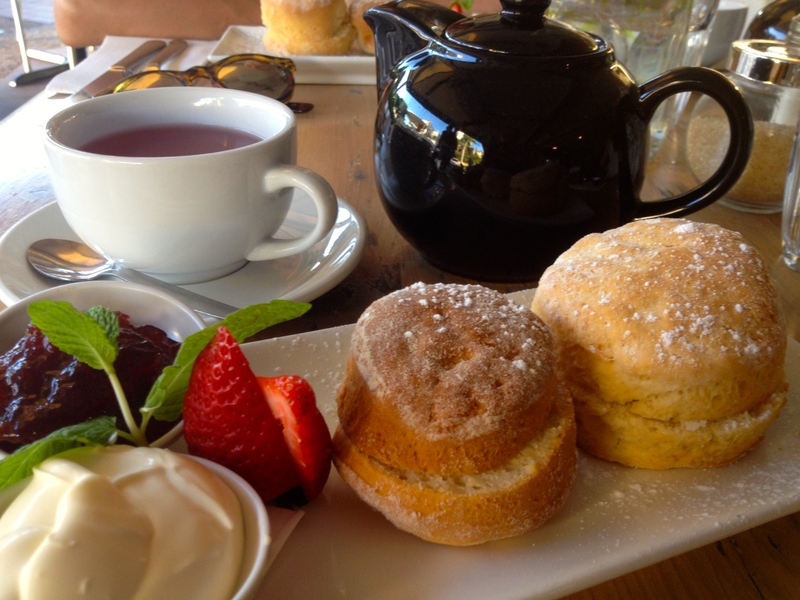 But there it is in black and white, “Fresh scones with jam and fluffy cream.” Fluffy cream? That’s certainly a novel way of describing cream. The cream is anything but fluffy, more akin to double thick, which is mighty fine by me. There’s nothing fancy about the jam, but I do like the way the Devonshire Tea is presented; the sprig of mint and the fresh strawberry with a dusting of icing sugar makes for a pretty afternoon tea. The scones however, both of markedly variable sizes, are dry and rather unappealing as far as scones go. Tea: A few choices of loose-leaf teas served in a good-sized pot. Overall: A lovely open and airy venue for afternoon tea.